The changes aren’t big, but they do illustrate even more strongly just how much of a myth the whole “pause” idea was. Always has been. Yet the pause is there in the old and new GISS data, large as life. The lack of strong warming in the last 20 years or so is readily seen. Tamino’s argument ignores the fact that there is no warming in many datasets, including GISS, for varying periods of up to about 19 years. That’s if you insist on a zero trend. If you’re prepared to accept some insignificant warming, I believe you can go back up to 25 years in some datasets. It doesn’t mean warming will never return, but it does falsify the models. It is also odd that the current year, incomplete as Tamino describes, in both datasets is already significantly warmer than 2010, yet the monthly data graphed at Climate4you has not surpassed 2010. The latest revisions to the GISS temperature data are bilge, based as they are on a hurried official acceptance of the incompetent paper by Karl (2015) et al., which deliberately tried to erase the lack of warming over the last 20 years by subordinating good data with uncertain data (from an uncertain source unintended for such use). The scientific community should be up in arms over the whole sordid mess that is “consensus” climate science, and you shouldn’t give an inch to any of those “experts” who have made it or any who now smugly promulgate it. I reject the GISS temperatures, and all others simiilarly suborned; I reject all of the adjustments that have been made solely in order to give the false indication of significant global warming. I reject the pronouncements of any and all climate scientists, who I know to be incompetent based upon the overwhelming evidence I have uncovered and brought forward myself, in my own way (and peer-review can go to the devil; it has been a monstrous lie, unfulfilling of its purpose and highest responsibility, that got climate science into this mess). Shame on today’s “leading” scientists, and all the leading voices that follow them. Well, you’ve put the matter clearly. I haven’t kept up with the new GISS dataset. Where’s a good place to read about it and is there any chance you could be wrong? GISTEMP was garbage before they adopted Karl et al. They are suspiciously regular but do at least have the effect of reducing a warming trend. No. The adjustments introduce a warming trend. At 1963 the adjusted values are 0.7 LESS than the raw data i.e the early data has been COOLED by 0.7 C.
GISS has been doing this all over the world, it is not atypical. Remember this is not a process like 7SS adjustments where disparate sites are being homogenized into one reference site for a location. Gisborne Aero is just one site. 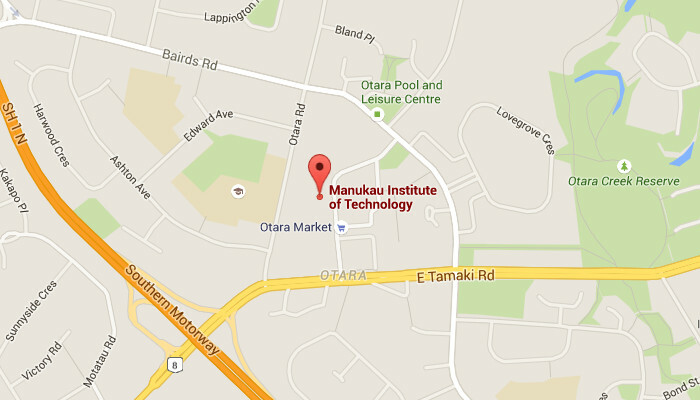 It is not a location of sites like 7SS is at Masterton for example. Ah. So the net adjustments are negative; I wondered. To adjust a single site like that (unless it’s justified by site changes, of course) is a fairly blatant application of “these data don’t suit my purposes”. The process may be different from NIWA’s but the effect is the same. What reasons does GISS give for the adjustments? I don’t know and I don’t think anyone else does, nothing forthcoming from GISS. Iceland’s Meteorologist asked and got talk-to-the-hand. I think the real reason is that GISTEMP is a political dataset (not scientific) for the politically motivated by the politically motivated. I worked the above out for myself just with a bit of mental arithmetic for a start to get a “feel” for what was going on then just set to with a calculator. Didn’t bother with a spreadsheet. I’ve documented it in ‘Temperature Records’ starting at the following link..
What started it was a Paul Homewood post ‘Cooling The Past In New Zealand’ which included Gisborne Aero, see here:(note you will have to get to page 2). As you can see it’s not just Gisborne Aero, it is all over NZ. Note you might have to delete delete “http://” from the URLs to get to the GISS datasheets. First thing of course is to compare GISS’s “raw” GHCN v3 with the Gisborne Aero data in CliFlo. I haven’t bothered to do this given the subsequent adjustments. Simon, you might have followed the link above to ‘Temperature Records’ and seen that the GISS adjustments to Gisborne Aero bear no resemblance to the BEST adjustments to the same site. This I’ve found is the same for sites in Australia and South America, and other NZ sites. 1) Are they both technically correct even given the disagreement? If so, how do you explain this in technical terms? If not, why are you so enthusiastic for both? 2) Or is the technique of one to be favoured over the other? >“If it’s so obvious, why doesn’t everyone believe in climate change?” But the brochure misses the simple truth—that it’s not obvious because it’s not happening. Man-made climate change (MMCC) is not happening that is. IPCC climate change criteria: radiative forcing “measured at top of atmosphere” (IPCC FAQ AR4 box 2.1 – “What is radiative forcing”). 0.6 W.m-2 TOA imbalance, trendless (Stephens et al 2012, Loeb et al 2012, IPCC AR5 Chap 2). 1.5+ W.m-2 CO2 “forcing”, trending (IPCC Table of Forcings, same as net anthro). Game over. CO2 “forcing” is more than double the TOA imbalance, CO2 is an ineffective climate forcing. Sfc imbalance is ocean heat accumulation. Therefore, TOA imbalance is simply solar SW going straight into the oceanic heat sink and lagged in energy out at Sfc and LW out at TOA. No need to invoke CO2 “forcing”. I should point out that it is actually impossible to invoke CO2 forcing – it doesn’t fit between Sfc and TOA. So they couldn’t be bothered with 20 people. Were they on some kind of commission? Clearly not. But, since they’re coming from Wellington, perhaps they found it hard to justify the air fares. They could have made a YouTube video and saved all those airfares. Or were they planning a bit of audience participation? Perhaps it was the sceptical post from yours truly that made them fear some mockery. We may learn the truth next year—but then again, the whole matter could be yesterday’s news after the December disaster in Paris. You mean I personally put them off? I know I can be off-putting, but I didn’t think my obnoxiousness had spread that far. No, I don’t mean that! By yours truly I meant myself! You are not obnoxious. Not always. Please don’t hide, or at least be brief—we need you. Focus on the December disaster that Paris will be. Membership has 5 levels including Full Membership for dudes with degrees and Associate Membership for undegreed dudes. Or In a Discussion of the Hiatus Since 1998, Grant Foster Presents Trends from 1970 to 2010, Go Figure! Tamino’s “followers” include Simon apparently. I wonder if the lecture would have covered cognitive dissonance and the Dunning-Kruger effect? Unfortunately those afflicted are the most likely to deny that they do. But by all means Simon, take the heat off your idol Tamino and your new found warmists dream-come-true GISTEMP, having thrown BEST under a bus (heh). A case in point is the use of extremist projections of global warming sea level rise by local authorities: “The Ministry for the Environment recommends planning for future sea-level rise of at least 0.5m, along with consideration of the consequences of a mean sea-level rise of at least 0.8m (relative to the 1980–1999 average) by the 2090s”. When the Kapiti District Council ignored local data showing a long-accreting shoreline to follow that advice and put coastal erosion risk profiles onto Land Information Memorandum reports, property owners challenged the Council in court and had them removed. Now, the Parliamentary Commissioner for the Environment is about to make the situation worse by hiring NIWA to draw up coastal hazard lines for the whole country – based on the UN’s exaggerated claims of rampant sea level rise. If their report, which is expected to be available later this year, is used by the government to determine coastal policy, widespread controversy will result. Simon, a tip. If you want traction lay out your case rather than just link to blog posts i.e. elucidate the details yourself. Sure, link to someone else’s rationale (not that we are unaware of Tamino, Hot Whopper etc) but you don’t actually display any understanding by doing this. Argument-by-blog-link doesn’t cut it Simon. The inept Dr Jan Wright again. There’s no evidence around NZ that the IPCC/MfE/NIWA predictions have any credibility whatsoever. Yes, but why don’t they just download the tide guage data and plot it out for themselves? We can, but if you can’t insure your house and the council are pursuing a policy of “managed retreat”, mere data isn’t enough. Legal action is the last resort, which is where it is heading, as I alluded upthread. I did email RT about this last night and am not too keen to publish information on the subject until more is know. However, the Kapiti coast has a legal precedent and this is what will happen, I suspect. EDIT – Christchurch City Council, like many local bodies, has some quite dogmatic and unmoveable staff. Simon, http://wattsupwiththat.com/2015/07/21/tamino-grant-foster-is-back-at-his-old-tricksthat-everyone-but-his-followers-can-see-through/ is Bob’s reply to Tamino’s article, referenced in the hotwopper article. HadNMAT2 was not used as “the reference” for ERSST v4. It was used to correct bias in ship sea surface temperatures only, around 10% of the measurements over the period that Bob plotted. The other 90% of measurements came from more accurate buoys. This is the problem. Bob and Willis and Anthony and others at WUWT don’t understand the science as well as they think they do. It’s called the Dunning-Kruger effect. I made a hasty comment on the way out the door to to work, apologies Andy. What I meant was, make some stand directly to councils with the historical data which proves the IPCC’s predictions are rubbish. This has been done elsewhere in the world e.g. North Carolina where ordinances cannot now be based on the IPCC predictions. Shoalhaven council and some other (can’t remember) in Australia took the initiative on behalf of their constituency but when councils base policy on fantasy then it is contestable. The more people that contest the better. And the more people who know the data the more who are forearmed. If contesting directly with council is unsuccessful then legal action is about the only recourse left I suppose if reason doesn’t prevail. But reason should prevail against the councils in the first instance by informed weight of numbers. My point is that the numbers have to have the facts at their fingertips and familiarity with what SLR is all about. I suspect a good many people (too many) have no idea of either. In other words, not enough weight of numbers to force the change by reason. This is something specific to Christchurch which is not simply IPCC models as I understand. Not sure how this can be contested, you are up against a “managed retreat” as you say. It is models on top of models as I understand. The former (IPCC) definitely contestable, the latter (local) a different animal again. The local model could be independently assessed. That’s about all I can see without knowing the details of the sedimentation study. Certainty of a sedimentation reversal around 2050 seems a stretch to me and very weak. Still a reference Simon, and enough to skew the final result. The buoy data was adjusted upwards 0.12°C to make it “homogeneous” with the longer-running temperature records taken from engine intake channels in marine vessels. In other words, good data was adjusted to match poor data. The extra warming trend was then guaranteed because the buoy network becomes more dense over the last 2 decades. Rather more than “Bob and Willis and Anthony and others at WUWT” were into the details of Karl et al from the outset and saw the shortcomings instantly. The paper wont survive. And the non-ARGO Karl et al series (i.e. best data neglected) isn’t corroborated by sea sub-surface temperature or satellites or HadCRUT4 (HadSST3 – see below) anyway i.e. they have extra warming along only a sliver of surface which is dopey. # The authors have produced adjustments that are at odds with all other surface temperature datasets, as well as those compiled via satellite. # They do not include any data from the Argo array that is the world’s best coherent data set on ocean temperatures. # Adjustments are largely to sea surface temperatures (SST) and appear to align ship measurements of SST with night marine air temperature (NMAT) estimates, which have their own data bias problems. $ The extend of the largest SST adjustment made over the hiatus period, supposedly to reflect a continuing change in ship observations (from buckets to engine intake thermometers) is not justified by any evidence as to the magnitude of the appropriate adjustment, which appears to be far smaller. 2. The greatest changes are made since 1998, which is interesting because this is when we have the highest quality of data and global coverage using several methods. Only this analysis finds any increase in global annual average surface temperature over this “hiatus” period. The authors have produced a dataset that is at odds with other surface temperature datasets, as well as those compiled via satellite. 3. The authors start their trend estimates in 1998 and 2000. This has long been considered unwise as 1998 is a very strong El Nino year and 1999-2000 is a much cooler La Nina period. The difference between them distorts their trend estimates. For example, their 1998-2014 trend is 0.106+/- 0.058°C per decade. Starting two years later (during La Nina influenced years) yields a trend of 0.116 +/- 0.067°C per decade as one would expect from starting at a lower temperature. Ignoring these caveats the authors say their analysis produces twice as much warming for 1998-2014 than earlier estimates. Their conclusion is, ironically, based on inbuilt biases in their analysis. Their Fig 1 shows that when using their updates it is only with the use of these inappropriate start and end points that the “hiatus” is reduced. 4. Even with the 11 changes to their SST database and the problem of start and end dates the authors admit that the statistical significance of their results is only significant at the 0.10 level, and in some cases not even that. “I believe their estimates of the error in their decadal trend figures are far too small. They quote the error in a 15-year period to a precision of one thousandth of a degree C. In their report the authors admit that their error analysis is not definitive and that looking at them another way invalidates their trend conclusions,” said Dr David Whitehouse, science editor of the GWPF. 5. Note that trends that include 2014 and 2015 must be treated with caution due to a recently persistent very warm feature in the NE Pacific that is affecting global SST estimates. 6. In addition, they do not include any data from the Argo array that is our best coherent data set on ocean temperatures. The authors state this is because Argo temperature data is not surface data. However, ship-derived temperatures can be from as much as 15 m below the surface. The Argo array samples 5 m below the top of the ocean. From 2004 to 2013 it shows considerable variation and little trend. The non-ARGO data aptly demonstrates the problem of starting trend analysis in 1998 or 2000. 7. Their conclusions are also at odds with satellite data that shows no trend in the past 16-years or so. So post 1980 adjustments to bucket measurements should be very small (under 0.1 C) Moreover, by 2000 ship measurements were a minority of total measurements and all types of bucket were a small proportion of ship measurements (see figs 2 and 3 of Kent et al. 2010). These facts imply that post 2000 adjustments warranted by use in some ships of bucket measurements should be negligible. “The justification given for the change that had the largest impact on trends for the 2000-2014 time period – continuing to adjust ship SST measurements by reference to night marine air temperature (NMAT) data, ‘which have their own particular pervasive systematic errors’ (Kennedy 2014) – i.e. that some ships still continue to take bucket observations, appears to support only a very small adjustment,” said Nic Lewis, an independent climate scientist. This is a highly speculative and slight paper that produces a statistically marginal result by cherry-picking time intervals, resulting in a global temperature graph that is at odds with those produced by the UK Met Office and NASA. Meanwhile, contrary to Karl et al, the hiatus is clearly evident in BEST NZ which is influenced mostly by the 1998 El Nino that produced about a 0.4 C shift between 2 cooling trends and the record high temperatures since 1970. The predictions of coastal encroachment are based on the Tonkin and Taylor report which was commissioned by CCC. It proposes a one metre sea level rise is likely and two metres cannot be ruled out. They are pushing to make this national policy which will make many seaside properties unsaleable and uninsurable. OK, same as the T&T report to WCC where T&T explicitly stated they had made no effort to ascertain the historical rate of rise and used IPCC/MfE scenarios instead. This is negligent and relatively easy to contest. It’s the sedimentation study that is the difficult task. Did T&T do sedimentation modeling themselves or was that by some other outfit? I cannot see how just one sedimentation prediction for 2050, in this case a radical reversal, can be the basis of anything. Coastal communities all around the world are facing the challenges of climate change and sea-level rise. Here in Christchurch, there is often confusion about our coastline, because it is currently accreting, with periods of erosion from storm events. However, the long-term trend is of a shoreline moving further inland, and this is the trend we need to plan for. I’m getting “file not found” for the Tonkin & Taylor Coastal Hazard Assessment Report 2015. OK so it was T&T modeling based on IPCC scenarios, not the historical default i.e. this is negligent because the default is the risk unless the prediction can be proven valid – it cannot. This is what I was getting at upthread. Tim Sintes does not realize what is going on because he is not familiar with the historical data. It is not so much “computer modelling” that is at fault, it is computer modelling based on unrealistic and so far invalid IPCC scenarios. Yes, this is what I suggested upthread. This is what Shoalhaven did by getting in the NIPCC (including Willem de Lange), The problem would be if an “independent” assessment also used IPCC scenarios and left out the historical default the result would be the same. >”Christchurch Mayor Lianne Dalziel acknowledged there was uncertainty about how much sea levels would rise but defended the robustness of the science behind the council’s coastal hazards assessment. “There are real challenges around the how much and the when but there is no dispute around the science on sea level rise,” Dalziel said. “Robustness of the science behind the council’s coastal hazards assessment” ? I don’t think so, how can it possibly be “robust”? It is easily contestable. >”It would be up to the independent hearings panel to consider the evidence and to decide whether the council’s proposed approach was reasonable, she said. Given Tim Sintes statement above I’m not convinced Burwood-Pegasus Community Board really knows what this is all about i.e. they don’t know the difference between the current default data and the IPCC scenarios (which started 1990) therefore they don’t know how to contest this effectively. Just substitute Tonkin & Taylor for Whitehead & Associates. Only just got to work on time last night. Just pulled out onto the road and noticed a crowd at the beach. Turned out to be a southern right whale just offshore about 500m between the beach and Motutau Island. Quite spectacular, had to stop and watch for a while. A pod had been down at Papapoa. A newspaper reported some guy estimating seeing a whale about “20 metres” off the beach, heh. It would have been grounded that close. People have difficulty estimating distances across water. 40cm from 2015 is 80mm/decade or 8mm/year. Clearly, like Dr Jan Wright, these people have taken leave of their senses. I’d like to be able to access the Tonkin & Taylor Coastal Hazard Assessment Report 2015 because I suspect the Stuff reporting of it is wrong. I’m sure it would be similar to the T&T WCC report where the projection of 40cms begins 1990 for the 50 years 1990 – 2040 i.e. 200mm rise should already have occurred by 2015. Instead, only 59mm rise has occurred since 1990. A little less because the projection curve is exponential. For the first 50 yrs a linear approximation is near enough though. After 2040 the curve really takes off but if the curve is invalid at 2015 it is invalid for 2040 and not worth considering for 2090. It is the projection curve that CCC.govt is referring to with ““The long term trend” upthread. The actual long-term trend (the historical default) is only about 30% of the projection. Hence the angst. I keep saying in respect to Wellington which is essentially monotonic, has anyone noticed 180mm rise there? Same for Lyttelton and vicinity except that PSMSL graph is less regular than Wellington. The 15cm rise had already occurred by about 1983, there was nothing from then until the data ends just after 2000. Other tide guages around NZ that do have 21st century data (9 do, Lyttelton doesn’t) display a recent “hiatus”. Even Wellington is similar if you look closely at 2000+. Any notion of 80mm/decade since 1990 is absurd. Lyttelton SHOULD be up around 7250 by 2015. Unfortunately the data ends just after 2000 but 7250 is off that chart and not credible given all the other data around NZ. I very much doubt that Lyttelton is the exception that conforms to the IPCC/T&T projection. The “hiatus” in Lyttelton measurements is mentioned in the T&T reports. CCC obviously have an agenda with regard to Southshore. The government red-zoned the estuary side which has left the other properties exposed and without sea wall protection. T&T are milking this for all the fees they can get, as are others like Whitehead & Associates in Australia. They know they have a window of golden opportunity and they have a template they’re peddling around councils which is paying good fees. They’re in no rush to kill the goose that lays the golden egg. Anyone who thinks the motives of consultants like this are entirely altruistic is naive in the extreme. I’ve worked for similar consultants and know how fees are “maximized”. They get away with it until they end up in court or suchlike. But so often consultants get away with disaster unaccountable. I can think of a couple of hydro projects in this category although in one the consultants folded eventually. Admittedly design standards are higher for these types of buildings especially hospitals but I took one look at the remnants of CTV and was astounded by the design. It was done on-the-cheap. Same for the hydro collapses above. MOW designs would not have failed under the same circumstances. Consultants chasing fees are mercenary, make no mistake about that. Problem is unrealistic assumptions are common to both private and public planners. Just in the case of SLR, alarm pays good fees if you can get them. Everyone effected pays dearly as a consequence unless the scam is exposed. Best sector to be in is law when the AGW edifice collapses. They will milk it for all they can too. No matter how much adjustment is made to compile temperature series, it is inescapable for the warmies that the records occur in the raw data – not the adjusted series. Thus the historical records cannot be expunged. The interesting thing about the Christchurch Sea Level issue and related issues is that it awakens a lot of people from their slumber. Most people have lives to live, families to support, and jobs and communities to work with. Us OCD types, (well me anyway) have lower levels of trigger to get us going. If you are a non-climate nerd, just living your life, and then your life gets upturned by zealots, then it starts to get interesting. How much has NASA’s GISS climate research unit increased global warming under the Obama administration? It seems that under Obama, NASA has conducted a global warming fabrications corrections effort, especially focused on the most recent decades since the 1970’s. Of the total warming adjustments corrections applied to the 1980’s, 1990’s and 2000’s (through Aug 2005) they average out to a bureaucrat-made warming increase of +0.08°C per month….. This NASA non-random treatment and purposeful changes of past empirical evidence is beyond just being anti-science. It is fraud-like, with the root cause being attempts by bureaucrat-scientists to meet the political and propaganda agendas of government elites – agendas that have been blatantly obvious over recent years. Written by Thomas D. Williams, Ph.D., Breitbart News on 23 July 2015. The United States was heavily represented at the meeting, with ten mayors present as well as California governor Jerry Brown. The bizarre thing about the American delegation, however, was the absence of a single member of the Republican Party, as if the Democrats spoke authoritatively for the United States as far as ecology is concerned. Was it just dumb luck that kept Republicans away from the Vatican workshop, or was there some other agenda afoot? The mastermind behind the two Vatican climate workshops was progressive Argentine Bishop Marcelo Sánchez Sorondo, who has built up something of a reputation as one who likes to stack the deck in his favor, squelching opposing voices whenever possible. At a climate change meeting held in April this year in the Vatican, Sánchez notoriously purged the conference line-up of any “heterodox” scholars and silenced those who tried to make their unwelcome opinions heard. An egregious case of such purging came shortly before the April conference, when Sánchez “disinvited” French climate researcher Philippe de Larminat from attending the symposium when he found out that the scholar believes that solar activity rather than greenhouse gases are responsible for global warming. Just five days before the event, de Larminat received an email claiming there was no space left—which arrived after other scientists said that he should not attend, according to The Washington Post. Bishop Sánchez’s distrust of Republicans is also a matter of public record. When doubts were raised regarding his decision to invite known opponents of Catholic doctrine on abortion and population control to speak at the April climate-change conference, Sánchez spontaneously lashed out at “the Tea Party and all those whose income derives from oil” for instigating criticism of his actions, despite the fact that there were no evident ties between the climate-change skeptics that wished to participate in the workshop and either the Tea Party or the oil industry. By weeding out opposition, Sánchez’s carefully orchestrated meetings may serve to produce unanimous declarations of agreement among the homogeneous participants, but they do nothing to advance an open discussion of the issues. The Pope is ill served by well-choreographed meetings of yes-men who are unwilling to engage the environmental doubts and questions that trouble many in the world today. Ted Turner would have applauded that at the time he thought the optimum population of earth should be no more than about 300,000. Changed his mind since then, 1.5 billion or something now apparently. Turner didn’t seem to have the same complaint re CNN subscribers though. California – the land of fruits and nuts. Mike Royko was one of my favourite columnists. Sorry, off topic, but have you guys seen this? John Cook busted pretending to be Lubos Motl. Again, behind the public demand for enforced Sunday legislation is the Papacy, and Pope Francis is gaining traction not only in shaping the policies of nations, but he is also attempting to exert his influence and authority regarding the issue of global warming. He is scheduled to issue a papal encyclical this year with solutions to address the issue. It is reported that “in 2015, the pope will issue a lengthy message on the subject [global warming] to the world’s 1.2 billion Catholics, give an address to the UN general assembly and call a summit of the world’s main religions. The reason for such frenetic activity, says Bishop Marcelo Sorondo, chancellor of the Vatican’s Pontifical Academy of Sciences, is the pope’s wish to directly influence next year’s crucial UN climate meeting in Paris, when countries will try to conclude 20 years of fraught negotiations with a universal commitment to reduce emissions.”((http://www.theguardian.com/world/2014/dec/27/pope-francis-edict-climate-change-us-rightwing)) The purpose of this encyclical is to urge “all Catholics to take action on moral and scientific grounds…”((Ibid)) The article continues by saying that “the document will be sent to the world’s 5,000 Catholic bishops and 400,000 priests, who will distribute it to parishioners. According to Vatican insiders, Francis will meet other faith leaders and lobby politicians at the general assembly in New York in September, when countries will sign up to new anti-poverty and environmental goals.”((Ibid)) With over a billion Catholics worldwide, not to mention those denominations with close affinity to the Papacy who are essentially Catholics in doctrine and practice, the outcome and response to this Papal encyclical will have profound effects. As active as the Papacy has been in 2014 on many fronts, the year 2015 promises to be an even more critical year as the 78-year old Pope Francis plans to visit Sri Lanka and the Philippines in January, and later visit Bolivia and two other Latin American countries, then visit France and of course the United States for the World Meeting of Families in September. The following is a list of important strategic moves and footholds that the Papacy has gained in 2014 that will set the stage for 2015 and the ushering in of legislated Sunday observance, the enforcement of the Mark of the Beast. Answer: The forehead represents the mind (Hebrews 10:16). A person will be marked in the forehead by a decision to keep Sunday as a holy day. The hand is a symbol of work (Ecclesiastes 9:10). A person will be marked in the hand by working on God’s holy Sabbath or by going along with Sunday laws for practical reasons (job, family, etc.). The sign, or mark, for either God or the beast will be invisible to people. You will, in essence, mark yourself by accepting either God’s sign or mark, the Sabbath, or the beast’s mark, Sunday. Though invisible to men, God will know who has which mark (2 Timothy 2:19). It will be interesting to see what comes out of the World Meeting of Families in September. 1. In order to know what the “mark” is, we must first identify the beast. How does the Bible describe the beast? To identify the dragon, we go to Revelation chapter 12, ……………………………. So the dragon represents pagan Rome, of which Herod was a king. The power behind Herod’s plot was, of course, the devil (Revelation 12:7-9). Satan acts through various governments to accomplish his ugly work in this case, pagan Rome. We will quote just two supportive references from history, though there are many: (1) “The Roman Church … pushed itself into the place of the Roman World-Empire, of which it is the actual continuation. …The Pope … is Caesar’s successor.” 2 (2) “The mighty Catholic Church was little more than the Roman Empire baptised. Rome was transformed as well as converted. The very capital of the old Empire became the capital of the Christian Empire. The office of Pontifex Maximus was continued in that of Pope.” 3 So this point also fits the papacy. She received her capital city and power from pagan Rome. So the papacy is here saying that it changed Sabbath to Sunday and that virtually all churches accepted the new holy day. Thus, the papacy claims that Sunday as a holy day is the mark, or symbol, of her power and authority. 4. Did God predict such a change in Scripture? A. How has the papacy tried to change God’s laws? In three different ways: In her catechisms she has (1) omitted the second commandment against veneration of images, and (2) shortened the fourth (Sabbath) commandment from 94 words to just eight. The Sabbath commandment (Exodus 20:8-11) clearly specifies Sabbath as the seventh day of the week. As changed by the papacy, the commandment reads: “Remember that thou keep holy the Sabbath day.” Written thus, it can refer to any day. And, finally, she (3) divided the tenth commandment into two commandments. B. How has the papacy attempted to change God’s times? In two ways: (1) She has changed the time of the Sabbath from the seventh day to the first day. (2) She has also changed God’s “timing” for the beginning and closing hours of the Sabbath. Instead of counting the Sabbath day from sundown Friday night to sundown Saturday night as God mandates (Leviticus 23:32), she adopted the pagan Roman custom of counting the day from midnight Saturday night to midnight Sunday night. God predicted these “changes” would be attempted by the beast, or Antichrist. The next step for the papacy, having taken most of Protestantism with it, is to have govt’s around the world legislate RC doctrine over all people (including atheists) on RC behalf seeing RC cannot do this itself (as a Roman Emperor could). If you think the Roman Empire declined and died eons ago and therefore can have no further political power, think again. This is indeed an exciting time for us all Simon, I am sure you feel the exhilaration in the air. If the CO2-forced model-based “possibility” was to occur it would already be evident – it isn’t so Hansen’s scenario is merely bedtime story fantasy. It might scare kids and credulous but that’s about all. Manhattan should already be inundated according to his previous predictions. IPCC climate change criteria: radiative forcing “measured at top of atmosphere” (IPCC AR4 FAQ 2.1, Box 1 – “What is radiative forcing?”). # 0.6 W.m-2 TOA imbalance, trendless (Stephens et al 2012, Loeb et al 2012, IPCC AR5 Chap 2). # 1.5+ W.m-2 CO2 “forcing”, trending (IPCC Table of Forcings, same as net anthro). Sfc imbalance is global average ocean heat accumulation (around 24 W.m-2 tropics). Therefore, TOA imbalance is simply solar SW going straight into the oceanic heat sink and lagged in energy out at Sfc and LW out at TOA. No need to invoke CO2 “forcing” and it is impossible to invoke anyway – it doesn’t fit between Sfc and TOA. IPCC AR5 Chapter 10 Detection and Attribution fails to address this. That’s scary too if you overlook maximum SSTs, the boiling point of salt water, the inability of DLR to heat water, the cooling effect of net IR at the ocean surface, the miniscule effect CO2 change has on DLR, and so on. Or, put another way, that is the bizarre prognostication of an alarmist nutcase who abandoned objective science long ago in a quest for a political lever. Who wins when a scary, but edge-pushing new climate study led by one of the world’s most prominent climate scientists makes headlines before it is either peer reviewed or published? Everybody, and nobody. Let me explain what I mean. The 66-page “discussion paper” (the authors’ description) was posted Thursday in Atmospheric Chemistry and Physics Discussions, the discussion forum of the European Geosciences Union journal Atmospheric Chemistry and Physics. So why does everyone lose? Most of the initial coverage from journalists who had an advance look, including Holthaus, stressed that the paper had not yet been reviewed. Another sign of trouble was that, despite the publicity push, the Associated Press, The New York Times, the BBC and The Guardian (despite its yearlong push for climate action blending advocacy and reporting) were among those who steered clear of the study. Listen to the taped call to get a visceral sense of the concerns of Seth Borenstein, the longtime climate reporter at the A.P. As it turns out, those who held off were wise to do so for a reason unrelated to the lack of advance peer review. That portentous section above — which in many ways is the only part of the paper that is news given how it centers on the “likely” inundation of most coastal cities in this century without aggressive emissions cuts — is not in the version the journal has posted. The final draft posted for discussion has more nuanced language, in line with what those arguing for more near-term climate and coastal risk have already articulated. Should everyone who excerpted quotes that aren’t in the paper now correct the stories? I’ll leave that up to them. Maybe we’ll all be a little slower on the draw next time when work is promoted before it is publicized or peer reviewed. This isn’t the first time those covering climate science have been through this drill. “The new Hansen et al study is provocative and intriguing but rife with speculation and “what if” scenarios. It has many conjectures and huge extrapolations based on quite flimsy evidence, but evidence nonetheless. In that regard it raises good questions and topics worthy of further exploration, but it is not a document that can be used for setting policy for anthropogenic climate change, although it pretends to be so. The paper is long. It hinges upon interpretation of paleo and other data that is apt to be somewhat controversial. It uses a model that is coarse resolution and which does not have a very good climate simulation. The evaluation of the model leaves much to be desired: no differences are shown compared with observations, and some errors are large. No mention is made of ENSO or Pacific decadal variations that dominate interannual and decadal variability in the real world, and which are a key to understanding the recent hiatus, and recent trends that are not representative of longer-term trends, although frequently interpreted as such. In section 4.5, the authors point out the need to simulate a number of features realistically and the model does not really do them very well, especially basic things like sea surface salinity. So the relevance of the model is not established. They use the model for a number of highly artificial experiments that are supposed to depict melting of ice at high latitudes: ”freshwater injection.” These experiments introduce a lot of very cold fresh water in various places, and then they see what happens. The question is how relevant these are to the real world and what is happening as global warming progresses? They do not seem at all realistic to me. A key to a lot of this is how clouds change, and one needs to get clouds right in the first place to have confidence in the results. Unfortunately, this is an area where major problems exist. Huge problems occur over the southern oceans for instance and all models have far too much sunshine penetrating to the surface compared with observations. No doubt the southern ocean, featured strongly by Hansen et al, plays an important role, but data there are poor, and change is not well known; in particular the recent hiatus in global warming greatly influences any observations, which can therefore be quite misleading wrt trends. I certainly do not believe the result claimed with regard to less snow over Antarctica with a warming climate. Although Hansen argues that the real world is responding even faster than in the model scenarios, this is not at all clear owing to the natural variability. I don’t think all the cold ice melt water inflow that’s predicted would add much to ocean heat either. Well, it’s not going to take it to boiling point is it? Written by Thomas Richard, Examiner.com on 24 July 2015. […] The Gallup poll was done three weeks after the pope released his much-ballyhooed climate Encyclical, which denounced capitalism (free markets) and criticized humankind for turning the planet into a sewer. Critics say that much of his Encyclical was largely ghost-written by environmental activists and United Nations’ ideologues. Prior to the Encyclical’s release, the Vatican held a controversial climate summit, and invited people like pro-abortionist Jeffrey Sachs and population-control proponent Ban Ki-moon to speak. As one pro-life group noted, “phrases such as ‘family planning,’ ‘sexual and reproductive health,’ and ‘reproductive rights’ are euphemisms for contraception, sterilization, and abortion.” According to Life Site, “Sorondo’s response was not only ‘surprising’ but amounted to him ‘openly defy[ing] the position the Holy See has held on these terms for over thirty years because of their association with abortion. '” Much of this was seen by Roman Catholics and pro-life groups as a slap in the face after years of battling abortionists, only to be undermined by the pope’s underlings. How long (read RC loooong) before Francis gets the chop? Then he gets it wrong by saying “removing this imbalance requires reduction of CO2”. IPCC AR5 Chapter 10 Detection and Attribution fails to address this little problem, so does Hansen. There is a half page article in Saturday’s Press from Christchurch, on the sea level issue and an interview with Tim Sintes. In other words, Christchurch and other councils are using the worst case RCP scenario, and then taking the upper bound SLR projection for that scenario, then adding some on for good measure. These figures may be plausible, but what is the probability of them occurring? The Intergovernmental Panel on Climate Change (IPCC) expects sea levels to rise another 30 cm or so by the middle of the century and up to a metre by the end of the century. That may not sound like much but New Zealand’s Parliamentary Commissioner for the Environment Jan Wright says it will be disastrous for the millions of people in Bangladesh and other countries who live in low-lying river deltas. It will also put in doubt the continued existence of Pacific island nations such as Tuvalu and Kiribati. “In New Zealand the impact will be significant at a national level and potentially devastating for some land owners,” says Wright in her 2014 report Changing Climate and Rising Seas: Understanding the Science. Just how high and how fast the water rises, Wright says, will be influenced by the speed at which the world – including New Zealand – reduces greenhouse gas emissions over the coming decades. Good grief, the incompetent Dr Jan Wright is back. “30 cm or so by the middle of the century”, actually by 50 years 1990 – 2040 as per IPCC, not 2015 – 2040/50 as per Wright’s inept reporting, is no where near the current trajectory (300mm vs 118mm 1990 – 2040). Just watched TV1’s simulation of Hansen’s (non peer reviewed) 3m rise scenario applied to Auckland. What a load of baloney, I bet there was plenty of LOL around the living rooms. Renwick wasn’t convinced either but he thinks it is just “a matter of time”. Some idiot councilor thought SLR was right on track with predictions – “I’m with Hansen” he said (duh). Fodder for the gullible, including our own Simon-the-Gullible. Political science by press release. Yes, we figured that out for ourselves Jimbo. Written by Marc Morano, Climate Depot on 24 July 2015. Michael Mann have a go at Hansen too? Hilarious, I’m surprised he’s got time to look at this paper between taking people to court and blocking “deniers” on Twitter. I don’t necessarily think Hansen is correct, there are a number of reasons why today is not exactly like the Eemian period. But, many scientists would agree that 5-9m of sea level rise is already ‘baked in’, the big question is how long it will take to get there. At current (linear) sea level rise we probably have time to adapt. We might really need that anticipated Maunder Minimum to give us sufficient time to sequester more CO2. The super storm idea is interesting but there is no evidence to date. Nowhere does Hansen say that the oceans will begin to boil. I don’t think there is sufficient governmental will to genuinely keep below the 2 ◦C threshold, so all we do is hope that Hansen is wrong. Many people would agree that many scientists are ‘baked in’ too but the point is CO2 has nothing to do with SL. CO2 is accelerating but NONE of the tide guage SLR series are accelerating anywhere in the world. The Pliocene is the geologic era between five million and three million years ago. Scientists have come to regard it as the most recent period in history when the atmosphere’s heat-trapping ability was as it is now and thus as our guide for things to come. Recent estimates suggest CO2 levels reached as much as 415 parts per million (ppm) during the Pliocene. With that came global average temperatures that eventually reached 3 or 4 degrees C (5.4-7.2 degrees F) higher than today’s and as much as 10 degrees C (18 degrees F) warmer at the poles. Sea level ranged between five and 40 meters (16 to 131 feet) higher than today. The default rate of rise is the historical rate of rise. At Lyttelton the IPCC’s prediction is on course to be 2.5 times HIGHER than the default (as it is now). And that prediction is only 0.3m over 50 years – already WRONG. If the IPCC’s prediction is wrong after only 25 years then we can completely rule out any higher scenarios like Hansen’s. That frigidity is one of the last things the world needs Simon. Other “we” KNOW Hansen is wrong. There is nothing any government can do to control the earth’s global average temperature by regulating CO2 emissions. CO2 is not an effective climate forcing. Then he gets it wrong by saying “removing this imbalance requires reduction of CO2″. It’s game over for CO2 forcing Simon. Not a good look for the Pontiff, again. Kaiser agrees with the Mayors for his point and I don’t dispute that (good point) but the Mayors were all Left leaning Liberal. There was not one US Republican Mayor for example. So naturally the Mayors attending consider “control” a “moral imperative”. They really really REALLY like “control”. Besides, since when do Mayors call the shots? Presumably the lightening strike was actually a giant “laser beam” created by Dr Evil at a big Oil that struck down the unfortunate scientist. Report, which is due for final publication in 2014. The problem may be in the communication. Equations turn most people off. So do acronyms. It is like reading a foreign language. We have to explain the point in words, we can use graphs, but only ones where people understand what is being graphed. I appreciate your criticism and certainly agree the problem is in communication but I have a simple case expressed in the most concise terms which correspond to the terms in the references. This is the science, it is “non reducible” as Monckton et al would put it. I disagree (to a degree). There have already been screeds of words written but still nobody “gets it”. The IPCC has explained the point “in words” all we have do is refer to them and highlight the fact the IPCC is ignoring its own criteria. Hansen has taken the focus back to those words (IPCC criteria) in his “discussion” paper (see Twitter excerpt previously https://twitter.com/hockeyschtick1/status/624410460821958658). What is needed is LESS words, not more. And pictures. And a simple narrative to bind it together – the less the better. I have used only one equation and two acronyms – that’s hardly eye glazing stuff surely. 2012, IPCC AR5 Chap 2). CO2 is impossible to invoke – it does not fit. If most people cannot grasp this from those 3 bullet points then there is something seriously wrong with our education systems. But the problem with the acronyms and equation is solved by the pictures below. OK this is where pictures tell a thousand words. Pictures of earth’s energy flows (the criteria). Figure 1: Surface energy balance. Observed and climate model deduced energy fluxes (all in Wm−2) in and out of the TOA (a) and at the surface (b). The observed fluxes (containing error estimates) are taken from Fig. B1 and the climate model fluxes are from simulations archived under the World Climate Research Programme’s Coupled Model Intercomparison Project phase 5 (CMIP5) twentieth-century experiments. The fluxes from a 16-model ensemble are summarized in terms of the range in model values (maximum and minimum fluxes) with the ensemble mean fluxes given in parenthesis. ‘SW in’ and ‘SW out’ refer to the incoming and outgoing (reflected) solar fluxes at the TOA and ‘LW out’ is the outgoing longwave radiation. Similarly ‘SW down’ and ‘SW up’ refer to downward and upward (reflected) solar fluxes at the surface, and ‘LW up’ and ‘LW down’ refer to the upward emitted flux of longwave radiation from the surface and the downward longwave flux emitted from the atmosphere to the surface, respectively. SH and LH refer to latent and sensible heat fluxes. Figure 3: Comparison of net TOA flux and upper-ocean heating rates. a, Global annual average (July to June) net TOA flux from CERES observations (based on the EBAF-TOA_Ed2.6 product) and 0–700 and 0–1,800 m ocean heating rates from PMEL/JPL/JIMAR (Ref. 26). Uncertainties for upper-ocean heating rates are given at one standard errorderived from OHCA uncertainties3. See Methods for a description of CERES uncertainties. b, Net TOA flux from CERES, ERA-Interim reanalysis24 and the one standard deviation about the 2001–2010 average of 15 CMIP3 models (grey bar) are anchored to an estimate of Earth’s heating rate for July 2005–June 2010 (see Methods). Radiative forcing is a measure of how the energy balance of the Earth-atmosphere system is influenced when factors that affect climate are altered. Radiative forcing is usually quantified as the ‘rate of energy change per unit area of the globe as measured at the top of the atmosphere’, and is expressed in units of ‘Watts per square metre’ (see Figure 2). I’ve condensed all this into one clear concise reasoning (back 2 in thread). Yes by all means pad it out, add in the actual references and provide the acronyms in plain English but the essence remains the same. There’s no getting around it. Does everyone see or not see this? [Jo] Richard, forgive me, I’m run off my feet. I’m just trying to help. These are all acronyms not words. Maybe some points are just too hard to describe? They might be right, but if the public doesn’t know the language we aren’t going to reach many people. Jo the case I’ve defined is as simple as it gets (“non reducible”). If we don’t at least put the case out there then it will never be communicated. And the case is in IPCC terms and definitions. What you are basically saying is that the public wouldn’t be able to understand IPCC reports either if they actually bothered to read them but they have reached the majority of people nevertheless. Our contra argument must also be in IPCC terms – mine is in every way. Think about it this way Jo. You are run off your feet because you are dealing with a mountain of stuff which is peripheral to the primary critical criteria. Not completely irrelevant or immaterial but effectively redundant once the primary criteria is addressed. Sometimes I feel I’m banging my head against a brick wall – even with sceptics. Doesn’t help when we get a post at WUWT that creates all sorts of confusion in comments. Seems the purpose of the post is to eventually “hoist SkS on their own petard” in a following post. Unfortunately, not enough exact parameters are given [by SkS] to allow the temperature contribution by CO2 to be calculated completely, because the effect of ocean thermal inertia has not been fully quantified. But it should be reasonable to derive the actual CO2 contribution by fitting the above formulae to the known data and to the climate model predictions. This assumes CO2 is the ocean heating agent – this is unphysical. Planetary thermal lag is in the solar SW => ocean mechanism, not LW. These are what is “effectively redundant” as I’ve pointed out “You are run off your feet because you are dealing with a mountain of stuff which is peripheral to the primary critical criteria. Not completely irrelevant or immaterial but effectively redundant once the primary criteria is addressed”. I get the impression Jo cannot run with a case that stops the MMCC conjecture dead because that would render all David’s work moot. The cynic in me is thinking Jo is working on a marketing exercise for David’s skills – I hope that isn’t so. Richard my friend, some simple advice from a simple cherry grower – do not use acronyms. Ever. Spell it out. Stop trying to sound all scientific by using scientific acronyms. Spell out each acronym – don’t be lazy. I cannot follow many of your posts because halfway through my brain tires of trying to solve your acronym puzzles. You see, even the acronym MMCC stops the flow of thought for me, albeit temporarily. It makes it hard to read mate. It is easier for you to type it all out – Man Made Climate Change – than for the reader to stop and check and wonder then check then remember then try and pick up your thread. In Jo’s pressured case, even more so. She is trying to be polite. She is trying to get your point, but nerd-speak is the obstruction. I think this describes the frustration on both sides of the communication divide with respect to you and Jo (and your wider readership such as myself). I would be able to understand some, if not most of the Intergovernmental Panel on Climate Change reports, only because I know most of the jargon and acronyms only due to hanging around these shadowy corridors for so long. Most do not (know nor hang). “… but they have reached the majority of people”? Huh? Think again RC. Only alarmist headlines have reached the majority of people. And those headlines usually have no acronyms. So, no, our contra arguments must be in communicable terms in every way. (Headlines, or subtitles), with drill-downs where necessary to IPCC terms, just to show the minority scientific readership that your point is valid. Jo is not so scientific. Me even less so. Get your point across to the likes of Jo and I and your readership comprehension will expand, I submit. Engage in scientific jargon only when challenged in scientific terms. Us great unwashed simply want to know what you are talking about. I make only editorial comments here, none regarding the validity of your argument. The IPCC is the worst offender for alphabet soup, with terms like RCP, SRES, CMIP5 etc. Furthermore, coming back to the sea level issue again, the projections of 100 years hence are based on our guesses of what the world economy will be like in 2100, which is somewhat absurd if you try to imagine the people of 1915 doing the same. At the end of the day, it comes back to Feynmanns famous quote on the scientific method. You make a guess (I.e a conjecture) . You make some models based on that guess. If the models don’t fit reality, it is wrong, end of story. I stand by that, This is as simple as it gets, if an intellect cannot grasp the problem then the intellect is totally out of their depth in just about aspect of man-made climate change except the most superficial e.g. polar bears, which is where the IPCC has caught the populace. But there are plenty of people who don’t stop at the superficial because they still remember a bit of school education even though they are not technically qualified. And you might be surprised at the education of tradies like electricians and heating, ventilating and air conditioning (HVAC) technicians too. The energy imbalance at the Top Of Atmosphere is nought point six Watts per metre squared and trendless. Citations: Stephens and others two thousand and twelve, Loeb and others two thousand and twelve, International Panel on Climate Change Assessment Report Chapter Two. Carbon dioxide “forcing” is one point five metres squared and trending. Reference: International Panel on Climate Table of Forcings, same as net anthropogenic forcings. The energy imbalance at the Top of Atmosphere is nought point six Watts per metre squared which equals the nought point six Watts per metre squared energy imbalance at the Surface. Now, having read the above expanded in Queens English, do you now see that the Man-Made Climate Change conjecture is disproved? Has the English really added anything except tedium (it certainly was tedious writing it)? The “forcing” does not fit between the Surface and the Top of Atmosphere, whether by acronym or English does not matter. But don’t forget that the IPCC cites Stephens and Loeb. This necessitates reading the papers and understanding the figures. What is the first thing you see on Stephens et al Figure 1? It is by neglecting to address the forcing-imbalance discrepancy that the IPCC has perpetuated alarm in the minds of the public. I’m simply saying – ADDRESS THE DISCREPANCY and the alarm stops dead. I’m starting to think (the cynic in me that is) many sceptics don’t actually want to put a stop to it because that would mean they no longer have a vehicle to display their talents and stroke their egos. Nowhere does Hansen say that the oceans will begin to boil. Oh, yes he did. My thanks to RC for finding some quotes. Any comment, Simon, perhaps a retraction? I know it stings when one’s heroes are shown up. Thanks to RC for the explanation – I can now read the underlying papers again. I was scrabbling for a minute to understand what “Sfc” was, now it is surface, it makes more sense. I suggest you read all of that box and possibly the whole page too Andy, not just what I’ve copied here. Yes exactly. Except in this case the IPCC has made the conjecture (FAQ 2.1, Box 1) but there is no need for recourse to models because the conjecture does not involve models. The reality is the TOA measurements, the conjecture is that a forcing moves the TOA energy balance away from balance i.e. an imbalance. Problem is: CO2 forcing is a different timing and magnitude to the imbalance and the imbalance has ALREADY been forced at the surface by the ocean anyway. Having done that everything just falls into place. The IPCC does not address this conjecture ending problem in Chapter 10 Detection and Attribution. Whether simply by sloppiness, willful neglect for political reasons, or whatever. Stephens et al (2012) does not occur in the Chapter 2 quote above but Chapter 2 does cite Stephens et al about four times in the context of global average energy budgets i.e. it is not as if they didn’t know about that paper. I found your ‘boiling oceans’ quote. He’s talking about Venus! Typical selective quoting without understanding the context. There is of course no reference to boiling in the paper. When I started work I had a female friend (not my girlfriend) who was a mechanical engineering drafty qualified NZCE (Mech). I only got to Int NZCE (Mech) but I was in civil’structural engineering at the time and qualified with Draughting Technicians Certificate which is civil engineering based. She ditched ME and went on to be a radiographer taking X-rays and such. I ditched Civil and went on to Mech/Elec in electricity distribution and business (NZ Dip Bus). Point is, here’s someone who in later life you would never think has much of an understanding of physics but in all probability can run rings around you. And radiography deals with radiation of the ionizing kind. Downwelling longwave radiation is non-ionizing as is solar radiation. These people know more about radiation-matter interaction than any climate scientist. It is because climate science has not deferred to these types of specialties (Optics is another e.g. Dr Roy Clark ‘A Null Hypothesis For CO2’) that has left them clueless on critical physics, e.g. the physics of the Atmosphere-Ocean (AO) interface. Dr’s Wratt and Renwick are qualified in atmospheric physics (Wratt is specifically, perhaps Renwick not as much) but that does not make them heat or radiation specialists. My friend, I know, could easily understand earth’s energy budget and how CO2 forcing is redundant even though I’ve haven’t brought it up (lost touch) and the AO interface (Surface, Sfc) energy budget too by intimate working and academic knowledge of radiation and radiation-matter interaction and fundamental thermodynamics from NZCE (Mech). There are many many people in hospitals and medical technological applications with this knowledge who are no dupes. It’s just that they have not been exposed to the simple concepts of man-made climate change that they could easily grasp. The IPCC would be dead if they were. Same for all the heat specialists out there. Think of Fonterra, Glenbrook, Tiwai Point etc. Are you saying Hansen is only applying his runaway greenhouse effect notion to Venus but NOT earth? … and that happened to Venus. i.e implying what happened to Venus could happen to Earth. That is NOT an “acceleration”. An acceleration would be, for example, 0.013 mm per year PER YEAR. There is TOTAL certainty that an acceleration in global mean sea-level rise has NOT begun. The posited man-made boost has not materialized. The posited man-made boost has not materialized. but they state that rate since 1850 has increased over previous centuries (based on paleo??) yet this is entirely consistent with the rebound from the LIA. The period of anthro attribution to the IPCC is post 1950 does not show anything unusual in SLR changes. The IPCC’s base date for man-made SLR is the average of 1980 – 1999 nominally centred on 1990 i.e. their predictions of a SLR acceleration begin 1990 and should now be observable – it isn’t. Dr Jan Wright neglects to stipulate the IPCC’s baseline in her SLR report (and probably her next impending report too). The Commissioner is incompetent but on $300,000 pa.
Venice Italy governance has been unmoved for some time. It’s a feature not a bug to them apparently. Thank you Richard. I appreciate your patience with my uneducated brain. I think you are saying that at top-of-atmosphere the energy in versus energy out leaves about 0.6 watts per square metre in the atmosphere. At the surface the energy down and up leaves 0.6 watts per square metre at the surface. With an identical “imbalance” at both surface and top-of-atmosphere there is no room for any imbalance in between. Therefore any posited forcing of CO2 in between is invalid. If I have that right, I have a couple of dumb questions. 1. What happens to the 0.6 watts – does it build up in the atmosphere and/or the surface? 2. What exactly is the CO2 forcing? I mean to ask where does the extra energy come from (the posited 1.5 watts). I think it comes from the surface – right? But the surface only has an extra 0.6. Nova received a Bachelor of Science first class and won the FH Faulding and the Swan Brewery prizes at the University of Western Australia. Her major was microbiology, molecular biology. Nova received a Graduate Certificate in Scientific Communication from the Australian National University in 1989, and she did honours research in 1990, investigating DNA markers for use in muscular dystrophy trials. For three years Nova was an Associate Lecturer of Science Communication at Australian National University. For four years, Nova jointly co-ordinated the Shell Questacon Science Circus, which operates all over Australia. From November 1999 to February 2000, Nova was the host of the first series of 65 shows of Australian children’s science television show Y? and worked for a short period on Space Cadets, a science fiction show by Foxtel. She has been a regular guest on ABC Radio as a science communicator, giving over 200 interviews. She is a director of GoldNerds, a gold investment advice business. Thing is, Joanne picks and chooses what she wants to communicate – that’s her prerogative (same with Richard T) and it is what makes her the top SH science blogger. However, she is constrained by what David Evens is doing (as she tacitly admits). My case, the IPCC critical case, renders David’s work moot. Putting CO2 in the earth’s energy flow budget would put a major spanner in the works for David, and therefore Jo. I don’t think I’m getting through to Jo not because of acronyms but because she is so frantically distracted by David’s work that she can’t see the wood for the trees. But think of this Mike. It has taken me well over a decade to see the wood. I’ve been into the models just like David, even down to Fortran code in GISS ModelE via their code browser and the formulaic expressions in ModelE, also into NCAR’s CAM-5 manual. And I was completely familiar with Stephens et al (2012) in 2012. It has taken me all this time to go back and distil the IPCC’s conjecture into its essence and to then introduce CO2 forcing as it should be introduced to the earth’s energy budget. It took me 3 years to get around to applying CO2 forcing to Stephens et al (2012). The IPCC didn’t bother. I’ve been calculating CO2 forcing on this blog ad nauseum since I arrived but that didn’t mean I was seeing the wood. I was applying it to the wrong place. So given my odyssey I don’t expect everyone else to instantly see what I see. But I do expect people who are up to their eyes in this to at least do their own investigation from the concise rationale and references I’ve provided. If that means having to learn the language of climate acronyms to understand then so be it, it’s not hard. And my legwork is saving you at least 3 years isn’t it? If I wrote out CMIP5 in long hand every time I would never have had time to crack the climate code. I note Andy has been motivated to read the papers that myself and the IPCC cite. I think once he also reads IPCC FAQ 2.1, Box 1: What is Radiative Forcing? then he will join the dots as I did – if he has time. Andy of course has a rather more immediate problem with the CCC (Christchurch City Council). NO, NO, NO. There is simply less energy leaving the planetary system than there is entering it. Where the energy is sequestered cannot be ascertained without recourse to the surface budget too. YES,YES, YES. See 1. below for more on this. NO, there is no other imbalance than TOA and Sfc. The next step is forcing. YES. You have it here. The posited “forcing” is there but it is ineffectual. 1.5+ trending is more than 0.6 trendless and the actual 0.6 forcing has already occurred at the surface anyway. NO, not dumb. Now you are getting to what this is all about. At the surface, predominantly in the ocean sub-surface. This is why the ocean is termed the planet’s largest “heat sink”. The capacity of water to hold heat is greater than any other material (except perhaps lithium) and far far greater than air. The equivalent of all the heat in the atmosphere is held in about the top 2.7m of ocean. Yes there is minor heat accumulation in the atmosphere but it is due much more to ocean heat dissipation than to direct solar heating and none by CO2 which is an energy transfer medium (Coolant. Refrigerant code for CO2 is R744). But remember that 0.6 Watts per m2 is a global average. In the tropics where the sun (shortwave, SW) heats the ocean, the accumulation of energy is in the order of 24 W.m-2 (Fairall et 1996). The accumulated energy is not all dissipated in the tropics therefore the heat moves by horizontal heat transport towards the poles. This is the planetary thermal lag, it takes 10 – 100 years for this process to work out (Dr Kevin Trenberth and a whole other body of literature). In the Southern Ocean there is the opposite of accumulation, dissipation. The planetary energy system is predominantly sun => ocean(+land) => atmosphere(+space), analogous to a pot of water on an electric stove element. If you want to heat it you turn the dial and WAIT. This is thermal inertia and lag. 2. What exactly is the CO2 forcing? It (CO2 forcing) is THEORETICAL, it is not real power. Climate science does not know this. The electrical analogy is “real” and “apparent” power. Any electrical engineer or electrician will tell you the difference. Just because you can measure power in Watts per m2 does not necessarily mean the power is doing work (the clue is energy-per-photon but ‘nuther story). >”I mean to ask where does the extra energy come from (the posited 1.5 watts). There is no “extra energy”. The only energy is from the solar source (SW in). The theoretical CO2 forcing which is now 1.5+ W.m-2 is posited, in theory, to “push” the TOA energy budget away from balance (i.e. 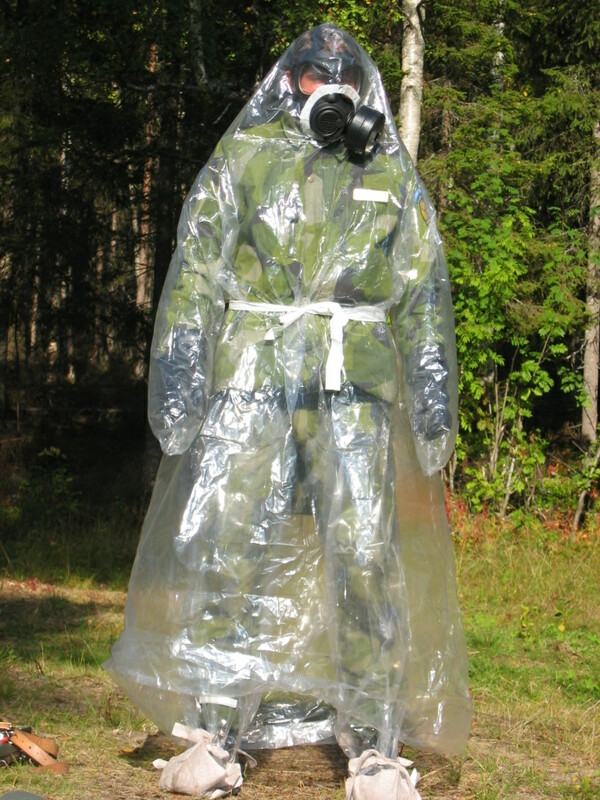 restrict outgoing radiation at TOA) and to keep on increasingly “pushing” it further away from balance. Problem is the balance has only been “pushed” 0.6 W.m-2 and hasn’t budged from that i.e. CO2 is an ineffective climate forcing, some other agent is doing the forcing. That agent is the solar SW oceanic thermal lag combo. 398 – 345.6 = 52.4 W.m-2 OLR Sfc. Note that OLR is just one of the heat transfer mechanisms from the surface. The other 2 are “Sensible heating” (24 W.m-2) and “Latent heating” (88 W.m-2). The 0.6 W.m-2 accumulation at the surface (and hence TOA imbalance) is because the incoming SW overwhelms the ability of the dissipation mechanisms to instantly move incoming solar energy out to atmosphere and space. This is because solar SW heats down to about 19m in ideal conditions in the tropics. Energy in sub-surface storage cannot all dissipate upwards so it dissipates horizontally and down vertically but to a limited degree. It is posited, theoretically, to force the TOA radiation budget one way or the other (accumulation or deficit). But in reality it is having no effect on the TOA energy budget whatsoever. Not right – I’m in a rush to work. It [CO2 forcing] is posited, theoretically, to force the TOA radiation budget [into] accumulation. A forcing, any real forcing, forces the TOA radiation budget one way or the other (accumulation or deficit). > Venice Italy governance has been unmoved for some time. It’s a feature not a bug to them apparently. Where do you get your information, Richard? Whether they are ‘moved’ or ‘perturbed’, I cannot say, but the Italian government has spent billions on a barrage intended to protect Venice from increasingly frequent flooding due to ongoing sea level rise and land subsidence. And the Dutch are planning for 0.65 – 1.3 m sea level rise by 2100. The difference is that the Dutch are largely below sea level already and are quite happy to maintain dykes etc. That is how I and many Christchurch residents see it anyway, that potential SLR is a convenient excuse to give up on the worst damaged areas. Screw the property rights of owners and screw the communities. National and local government, CERA, EQC and insurance simply don’t give a stuff. Andy: I don’t understand what you’re trying to say. Both the Dutch and the Italians in these cases are spending billions on flood defences in view of an increasing risk. Do you think they’re wasting their money? Seems admirably sensible to me. Concerning property rights, compensation etc, we don’t have good precedent in NZ for this situation and it would be good to resolve it before the next street/suburb becomes unliveable. I’m all for socialised risk-sharing, but not bearing costs unnecessarily. And you surely can’t expect insurance companies to bet against the odds. Christchurch is not planning for sea defences, unlike Holland. They demolished the estuary facing properties at Southshore during the red zone process, which has compromised the rest of the properties. The council will not build a sea wall because they (in their own words) say that sea walls do not work, and in the same sentence, the person concerned said that Sumner was in a better position because they have a sea wall. Therefore, based on RCP 8.5 which assumes unabated emissions for the next century, no technological progress whatsoever, and high climate sensitivity, all unproven assertions, and virtually no evidence based on empirical data of any existential threat to the community, the coastal suburbs of Christchurch have essentially been thrown under the bus by all the governing bodies, who are all too busy agreeing with each other and having endless meetings to actually bother taking any interest in the people that pay their wages. I should add that the sea wall protection was previously provided by the private properties that were estuary facing. They are needed to prevent erosion from southerly storms that can have waves lapping onto properties, very occasionally. During our 15 years in the area, our street and property have not been flooded a single time, despite numerous flooding events in greater Christchurch, especially those near rivers. Properties have been rebuilt in Southshore post earthquake, some projects costing a million dollars. Now they are struggling to get insurance from the same people who built the house. Not much joined up thinking. But then, most people haven’t even read the IPCC MfE and other reports that show that these projections are all guesses anyway. Just because other countries are doing the same doesn’t mean they are all right. Exactly, they are “unmoved” i.e. they are STILL THERE (duh!). Water inundation is a tourist attraction (“a feature”), tourists paddle around in the water when there’s flooding (SLR is the least of their problem). Tourists PAY for the experience. So of course the Italian govt is spending whatever it takes to keep Venice afloat (financially). My statement “unperturbed” is in comparison to panic stricken Christchurch City Council. The Dutch actually seek out the risk of inundation (they are risk seekers) in order to live on land claimed from the sea. They plan, build, carry on unperturbed. But CCC are risk averse (in the extreme). But CCC are risk averse (in the extreme). This is heavily based on the RMA philosophy. It takes the approach that humans “meddling” in nature makes things worse. I have a fundamental philosophical difference of opinion on this topic. My view is that by letting “nature takes its course”, especially in urban or sub-urban areas, things can become a lot worse. Thank you T Man. You support our contention. FAQ 13.1 shows historical rates of SLR (tide guages). These are the DEFAULT rates of rise. The IPCC’s posited man-made “acceleration” to SLR has NOT materialized. You can plot out the data from any of the 9 NZ tide guages that have data spanning 1980 to present (the default) and you can plot the IPCC/MfE prediction from 1990 (baseline 1980 – 1999 average) against the default (as we have done here at CCG e.g. Wellington – see below) and it is immediately apparent that the prediction is already overshooting i.e. the prediction is WRONG. Dr Jan Wright’s scenario, derived from the IPCC, is bonkers. This unrealistic thinking is causing all sorts of policy distortion and unnecessary costs and loss of value to landowners. SLR planning, including Christchurch, should be in respect to the default rates of rise which are easily manageable. These rates have been there all last century but did anyone even notice? 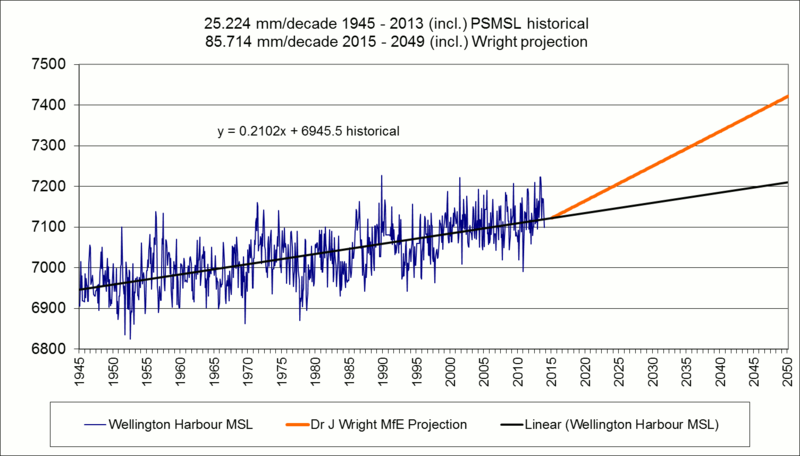 Historical record of sea level at Wellington. Red line shows projection issued by IPCC and echoed uncritically by Commissioner Wright. Shows the outlandish acceleration needed to meet the IPCC’s guess. Wright actually failed to stipulate the IPCC’s baseline for that scenario so the caption is not quite right. The 2015 baseline is inferred from Wright’s report date for that graph. But even when you plot 300mm from 1990, the prediction is still wrong. Same with the IPCC/NIWA prediction for NZ temperature. Both the Dutch and the Italians in these cases are spending billions on flood defences in view of an increasing risk. You acknowledged the influence of subsidence in Florence and you’re wrong to imply that the Dutch are threatened by inundation only because the sea level is rising. You ought to point out that it is relative sea level that is rising. In many places in north-west Europe and the Mediterranean coast, post-glacial isostatic adjustments are causing subsidence, affecting Holland and northern Italy (Florence). In a brief search I could not find details of the isostatic movements in Florence. Neither the Dutch nor the Italians, in engineering major works to prevent inundation, are responding to the IPCC’s insubstantial guesswork over some amount of sea level rise that might be caused by an indeterminate warming that may result from an indefinable increase in emissions that might issue from an unidentified future amount of human production. They are instead responding to solid observations.